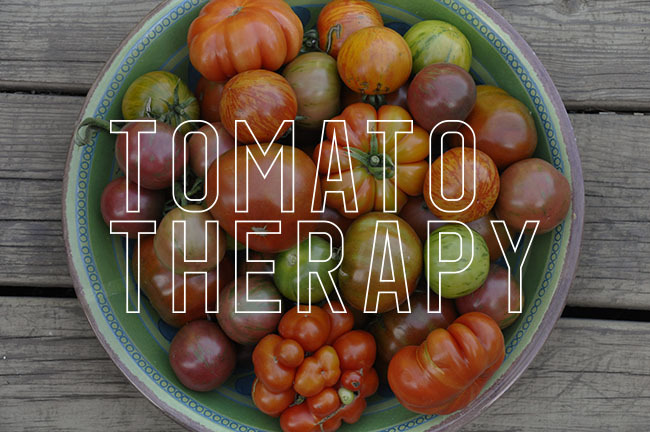 There are real reasons why many gardeners wish that they lived in Oregon or Washington, and there are even more reasons why some of the worlds most well know plant nurseries exist there - in the Pacific North West, the mild climate rich with moisture and mild winters allow plants to grow as if they are within the protection of a greenhouse year round. Here in New England - no so much. But we do have a few classic nurseries, in particular, White Flower Farm (and of course, Broken Arrow and Logee's Greenhouses - all are in Connecticut, but although each are treasures, White Flower Farm in particular is unique. 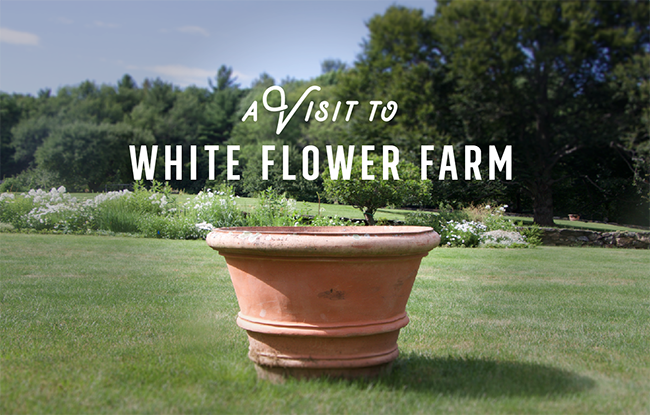 What I find appealing about White Flower Farm is it's backstory. A small mail-order nursery started by two New York writers - Jane Grant and William Harris in the 1930's whom grew it into a mail order business in the 1950's. Eliot Wadsworth bought the company from Mr. Harris in 1976 (about the time when I first visited while in high school- dare I admit), and the nursery continues to grow under both an active management team, closely watched by both Eliot Wadsworth and his son, Eliot Wadsworth II along with a talented staff of dozens of horticulturists and plant professionals. This makes WFF unique in todays world. Eliot Wadsworth (the younger) called me a year ago and asked if I could come visit - inviting me and a few other younger plant people down, to chat about ideas, so I gladly took advantage of this offer, for I have a special place for White Flower Farm in my heart. A load of cherries comes in all at once, which means a few busy days of canning. 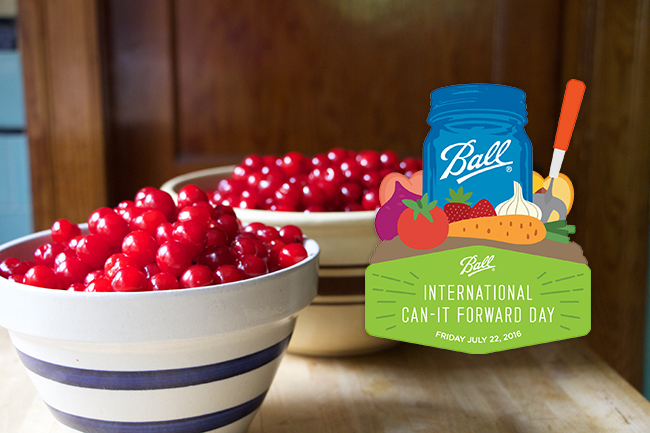 Today, Friday July 22 is International Can-It Forward Day. 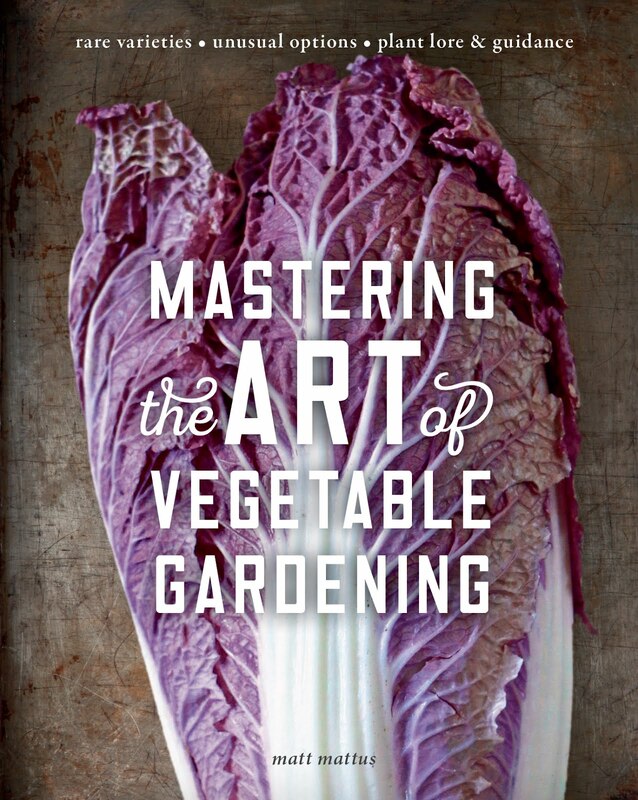 Ball canning company asked if I would participate and help promote their new book on home canning. If there is one thing that I remember that my mother used to tell me, was that when it was canning day, it would always be the hottest day of the year. Today, it was near 99 degrees F here in central Massachusetts, full-on cherry season, and of course, canning day. International Can-It Forward Day, to be specific. A couple of months ago, the fine folks at Ball Canning company contacted me to see if I would be interested in participating, and I gladly accepted - even though I try not review too many products or participate in too many partnerships, there are one or two a year which come along that are a good fit - an believe me, this was a good fit. This kitchen, which was my moms from around 1940 until her death in 1997 was canning central. Anyone who knew her, knew that canning was her passion. Our cellar was full of canned goods from my parents huge garden, if you don't believe me, look at the list below. I really wanted to help the home canning movement with #CanItForwardDay. TO make the whole thing sweeter, Ball Company is donating a dollar for every like or hit, on the posts we did for them, on their website. Good people. Lathyrus annuus var. 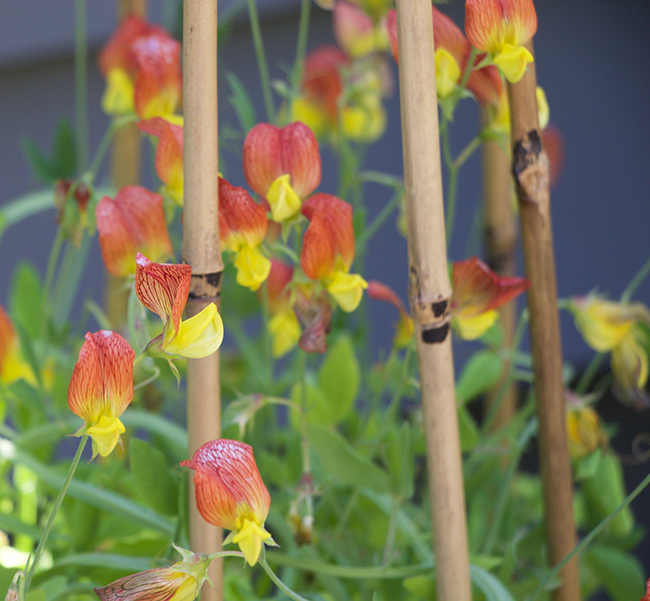 annuus, or 'Fodder Pea' has a flower color highly sought after by plant breeders looking to expand the palette of cut flower sweet peas - yellow. This species has a tiny flower, so will remain rarely cultivated, but it does have interesting foliage. OK, arguably, the many species of Lathyrus or sweet peas are less exciting then their cousins, the hybrids and many selections of L. odoratus which we all adore. 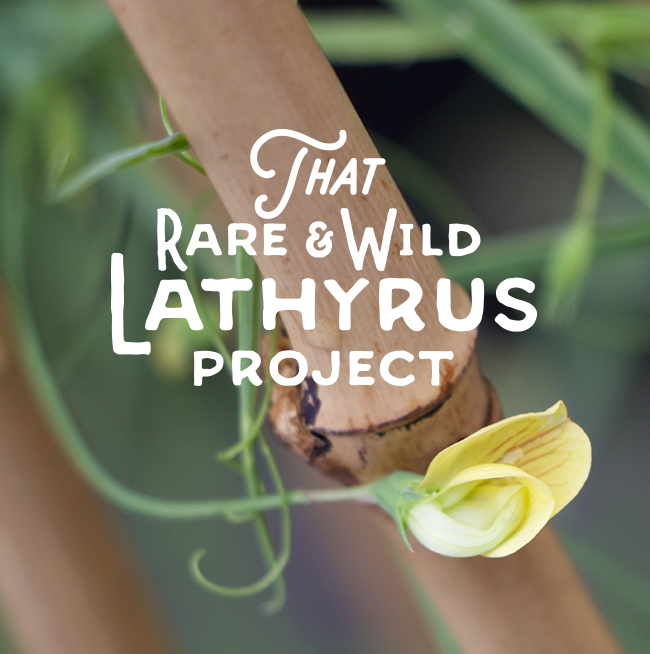 But, last February, when I announced my 'special projects' goals for the year, I mentioned that I wanted to grow a collection of Lathyrus species, and I felt that I really have to follow through. It's been a fun little project, and one which I may continue next year with even more species to trial. I've never seen a collection of peas raised in pots, in fact, I wasn't even certain if the pea species would like growing in pots, but I proceeded anyway, with my project goals (along with most of my other projects such as Phlox in pots, a collection of gooseberries and currants, and Mignonette (the Clematis in containers project was postponed for another year - Hey, I can't do it all!). Lathyrus belinensis is a very short-vine, no more than a foot long, which I was prepared for. It makes a very nice small container plant, but it is short lived. Named n 1988, it's one of the newer species, and one I feel is the most garden worthy. It is short lived though, like most peas. A collection of wild peas or pea species grown for their flowers seemed interesting enough, but I discovered, seed was somewhat hard to find - so I am on the hunt for more interesting species - if you have a source, let me know. Most of these came from Roger Parsons Sweet Peas in the UK, but if you know of a better source, please share . This made the project even more desirable for me, as now I had to track down some rare species, as well as some named selections of species. 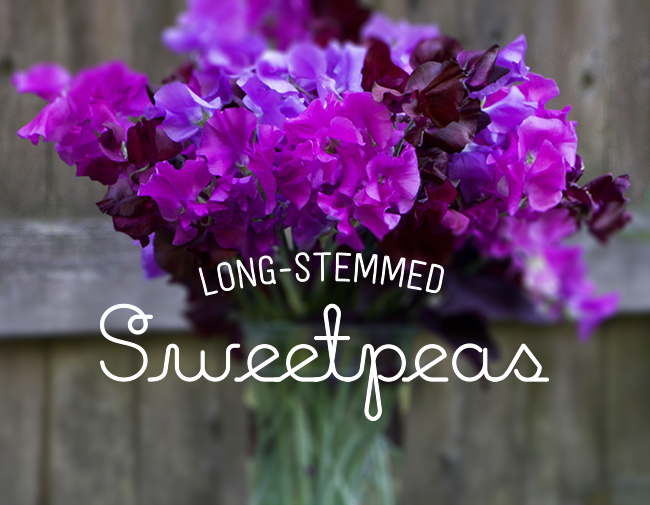 The current craze for sweet peas might have started because of my blog, at least so I have been told, but the truth is, they are due for a resurgence with the slow flower movement. These are flowers one will never see at the supermarket or nursery due to their short life and special needs, but that shouldn't stop you from raising your own at home. My obsession for growing Sweet Peas should come as no surprise to many of you. After all, I have grown so many over my lifetime. My long history and fascination with sweet peas in some way, began before I was even born - as my parents and grandparents raised them here in our garden. It's kind of comforting and nostalgic to think that the old soil here still contributes to the same, old vases around the house, some since 1915 or so. Even this past Saturday, I found a bud vase which triggered a memory of my mother using for sweet peas back in the 1960's, and surely long before that as she married my Dad in 1942 and moved in with my grandparents. It was sitting along side some old canning jars inside of a storage crate under our back porch, a nice reminder and one I hadn't remembered until now. We've taken a few days vacation after our North American Rock Garden Society conference in Steamboat Springs, CO which was rather exhausting yet terrific. 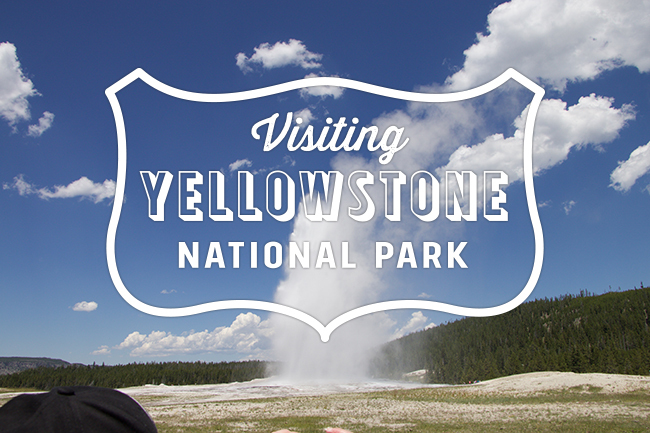 An 8 hour drive brought us to Jackson Hole, the Teton National Park and Yellowstone. 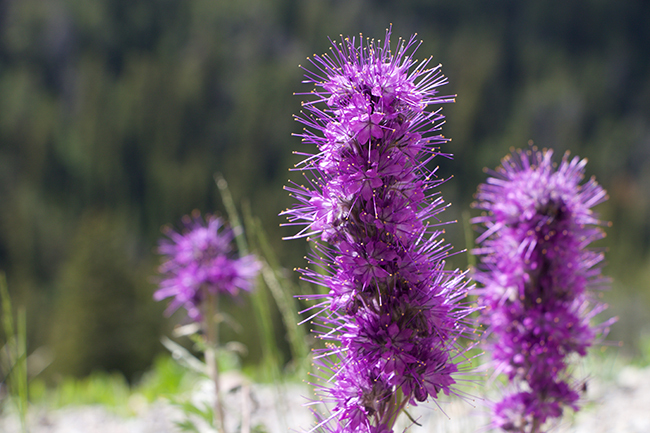 I rented a cabin in the Tetons for a few days, which allowed us to rest ( if one can call hiking and touring around this amazing National Park 'relaxing') and some time to explore and of course, botanize a bit. 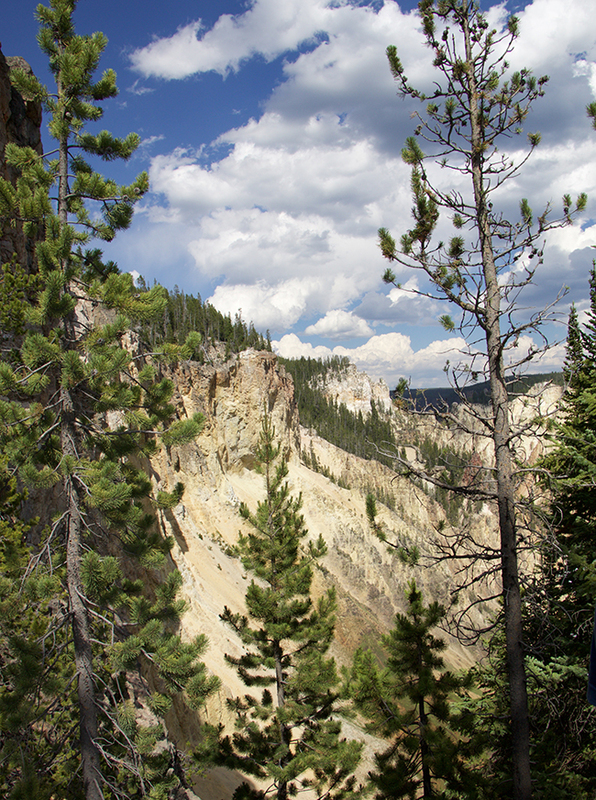 Mostly though, I wanted to check off Yellowstone from my bucket list. Since I am on vacation, I won't write much in this post. I'll just share some photos. Enjoy, and happy Fourth of July! The vistas and views were so magnificent, and strangely familiar even though I had never been here before. 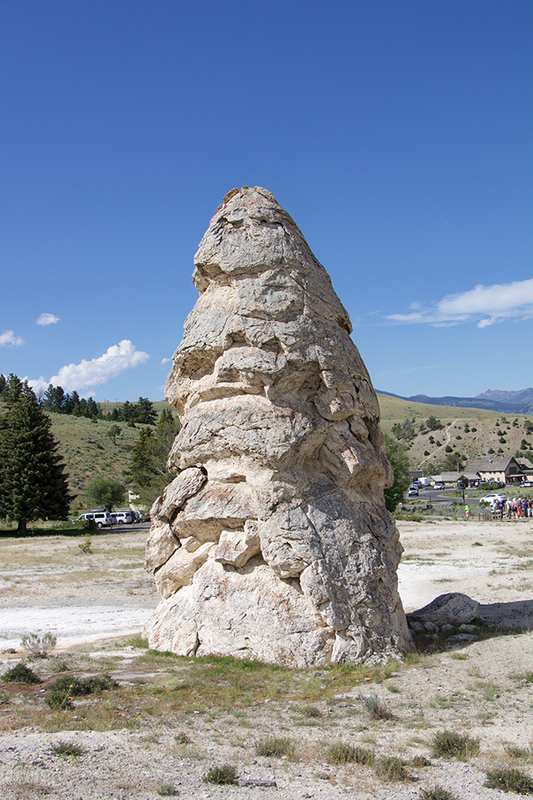 One just seems to 'know' Yellowstone especially if one is American. 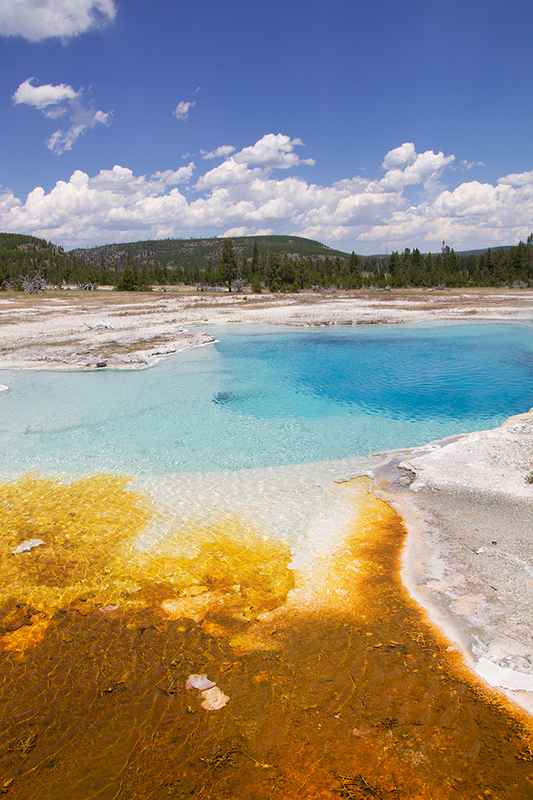 the geothermal features like Old Faithful, the Prismatic Pool, bubbling Mud Pots and the many fumaroles are as iconic as the many waterfalls in the park. 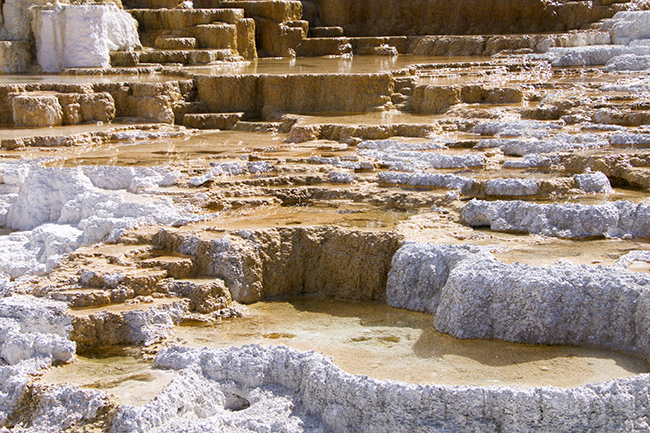 The tiered pools and travertine mineral deposits at the Mammoth Hot Springs didn't disappoint. The Azure Spring was not only perfectly clear, it was so colorful on our bright blue-sky day that the colors seemed artificial. 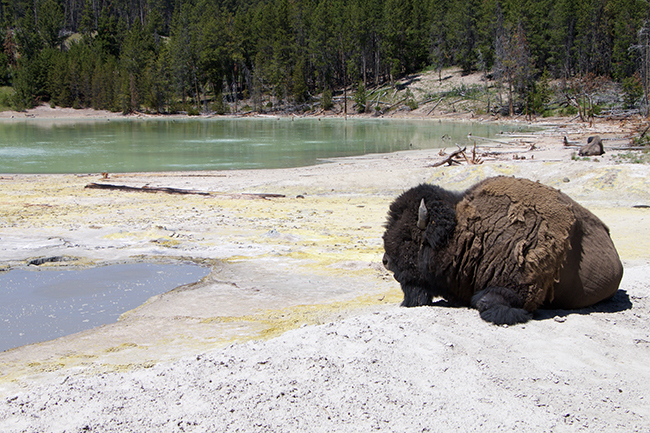 Bison were everywhere, and in early summer, males are independent, often resting near the many geothermal features, we felt, because of the dust bath opportunities - the minerals (sulphur) may help with mites and in shedding. 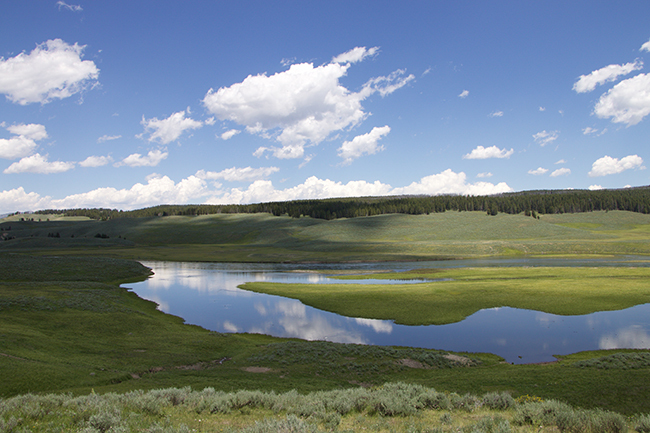 Yellowstone offers many large lakes, rivers and long vista's (not unlike Iceland), where one can see many miles of pure, virgin land. We learned a lot about the benefits of wild fires and forest fires, a the burn out above from ten years ago proves - a new forest can grow quickly.. 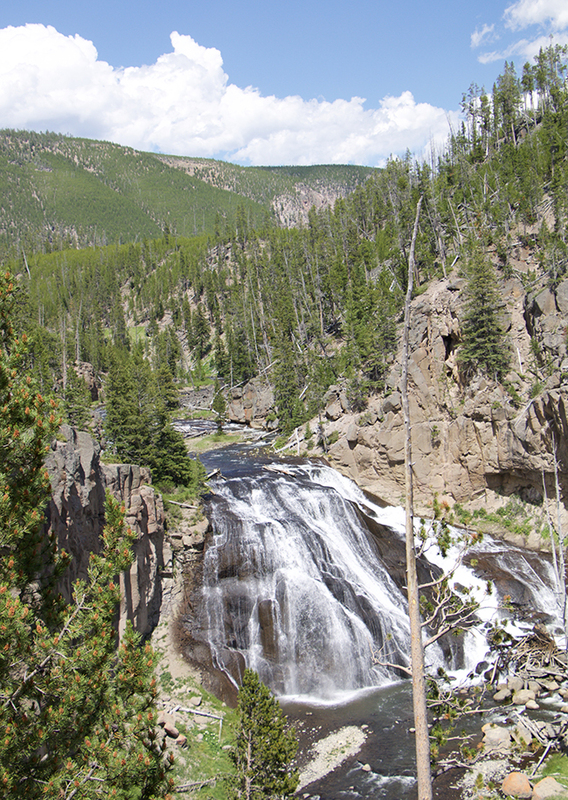 In fact, forest fire over-protection is one of the great concerns as natural burns help reduce the impact of the Pine beetles, which have affected nearly 31,000 square miles of forest in Wyoming, and have killed 95% of the large White Bark Pine trees. 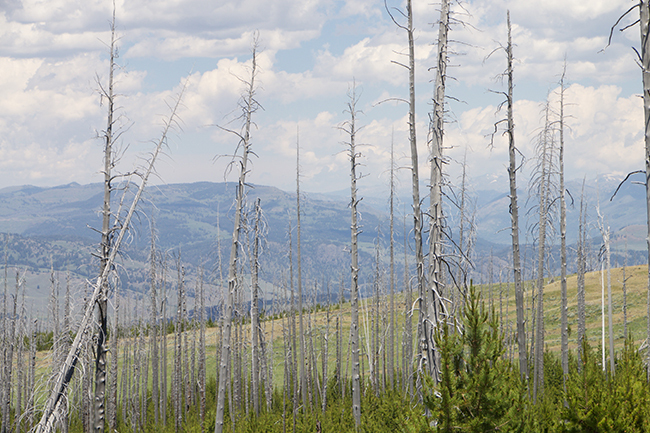 Most experts believe and temperature and global climate change is behind this devastating outbreak of Pine Beetle. 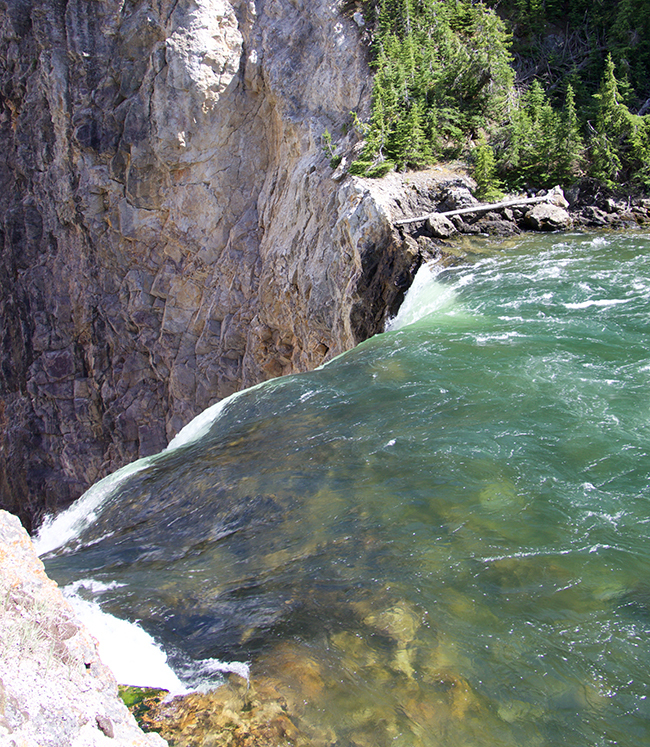 We could hear the roar of the Snake River as it tumbled over Lower Falls from high above the canyon, before we hiked the switchbacks down a few thousand feet. 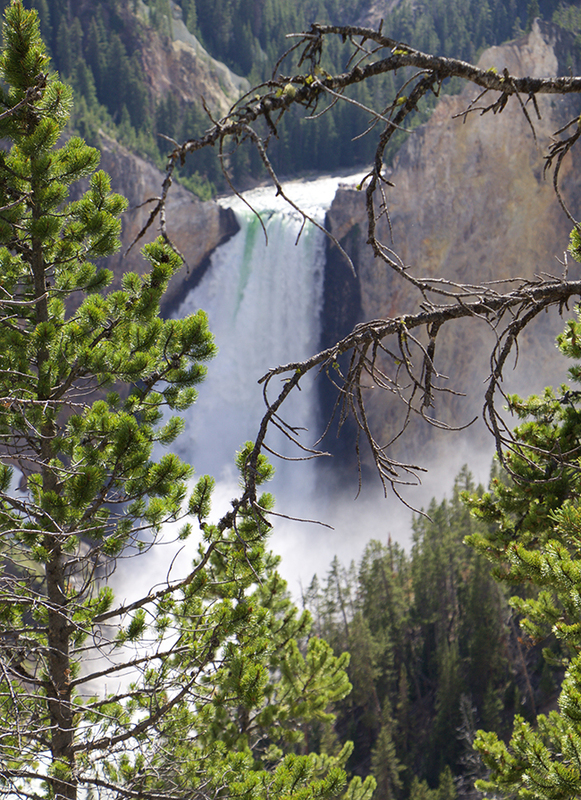 Up close, Lower Falls was even more powerful, and, of course, stunning. 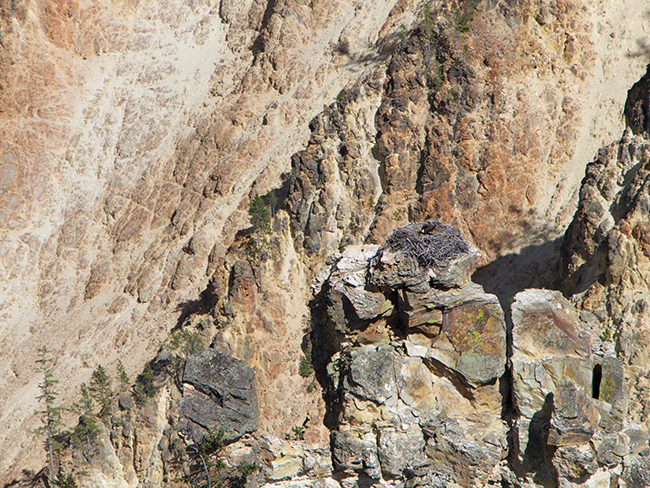 Once we hiked above Lower Falls, and near the edge of the Grand Canyon of Yellowstone, we spotted this eagle's nest with an eaglet. Can you spot it? 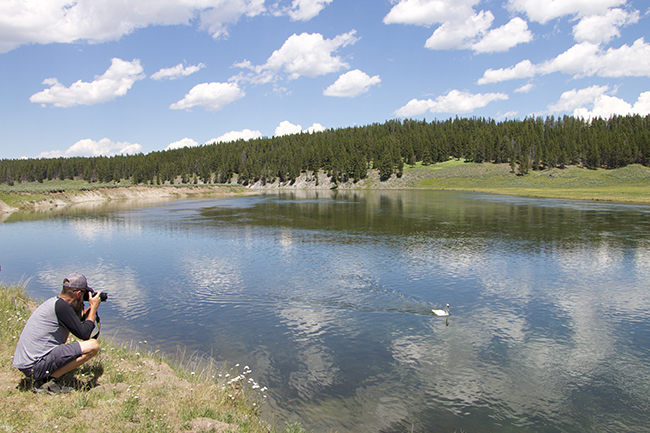 Joe photographs a Trumpeter Swan on the Snake River. 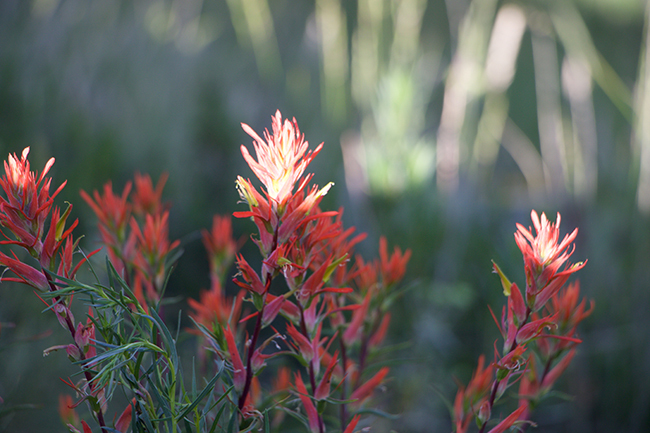 There are many species and natural hybrids of Indian Paintbrush growing throughout the West. I am not about to key out the species, but this red one was exceptionally pretty in the morning sunshine. Lance leaved Stonecrop, or Sedum lanceolatum growing near the edge if the Prismatic Pools. 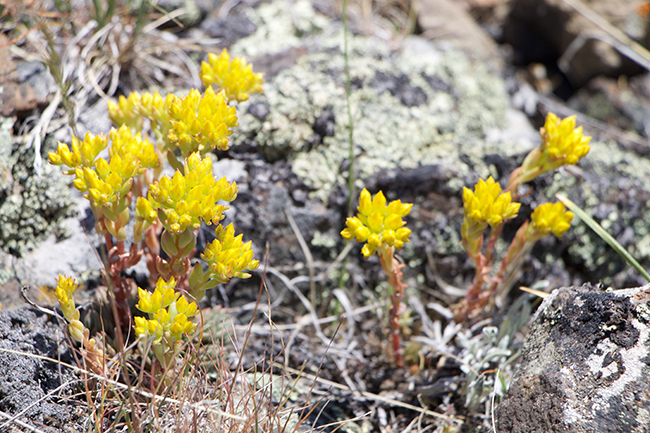 Sedum lanceolatum, seemed to tolerate the harshest conditions near steam vents and geysers. 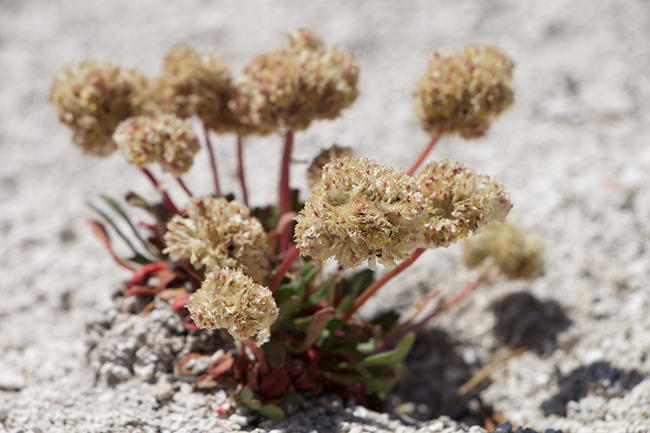 Eriogonum ovalifolium var. purpureum, Purple Cushion buckwheat. Most common were the yellow or sulphur Buckwheats. With so many species in the park, and my lack of any identification keys, I can only guess which species this is. 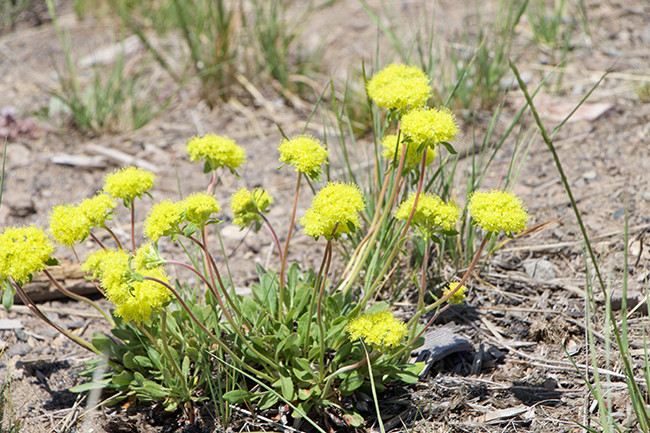 Perhaps Eriogonum flavum? 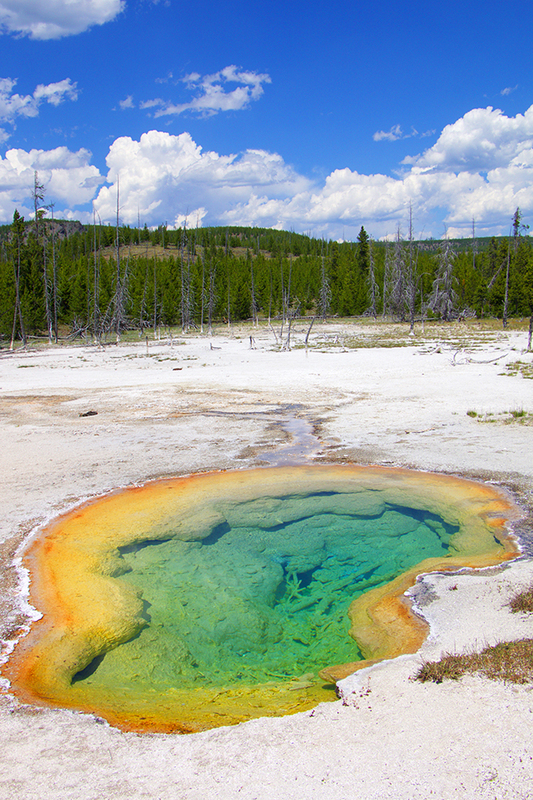 The Abyss Pool was breathtaking, at the West Thumb Geyser area of the park. Mimulus guttatus, a tiny yellow Monkey Flower seemed to prefer growing in volcanic pumice near the edge of what we believed were rather toxic fumaroles. 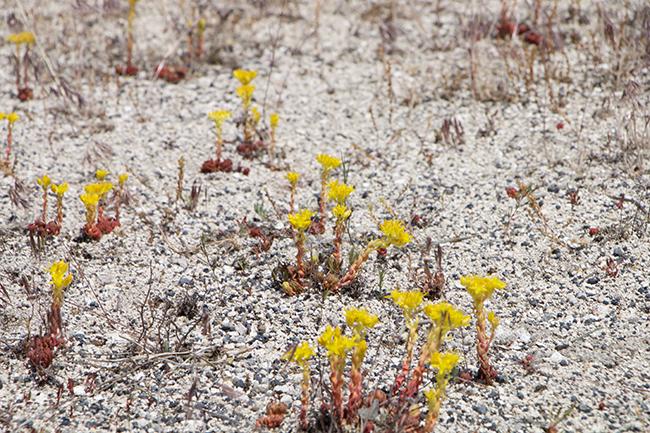 It was one of the few plants that grew near these sulphurous vents near Mammoth Hot Springs. 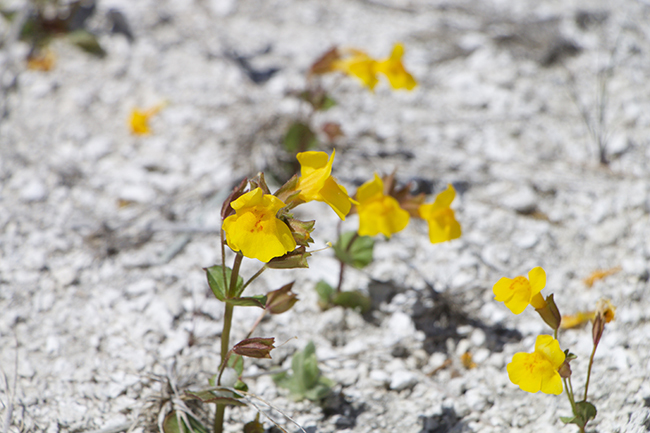 There are a few species of Monkey Flower or Mimulus in Yellowstone. We found the larger pink species, Mimulus lewisii just beginning to bloom near a stream. 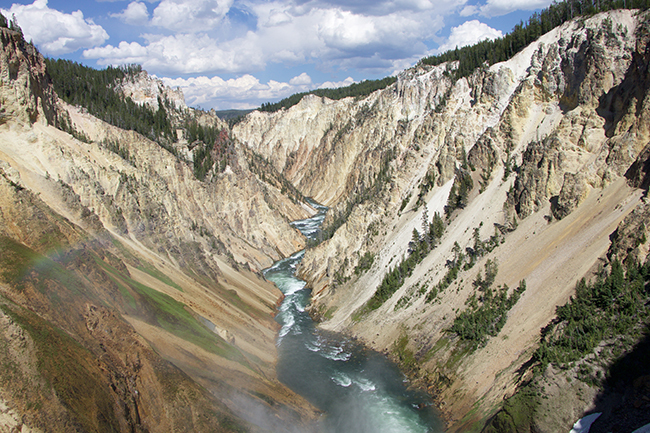 The Grand Canyon of the Yellowstone was magnificent. I mean, this reminded me of my brothers old Viewmaster slides of Yellowstone, when I was a kid. 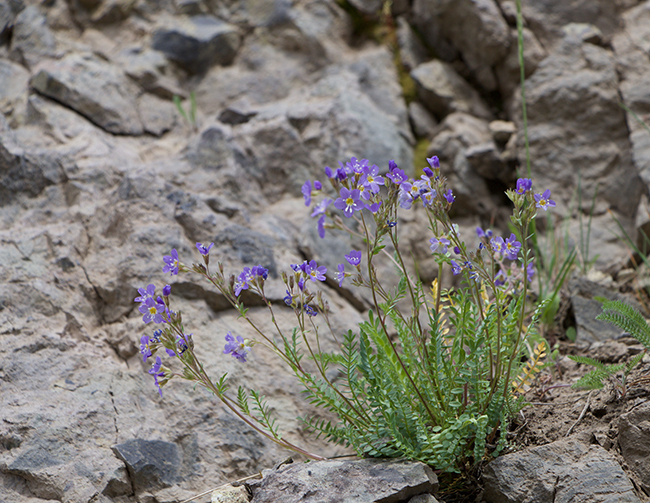 Polemonium pulcherrimum, a type of Jacob's Ladder. 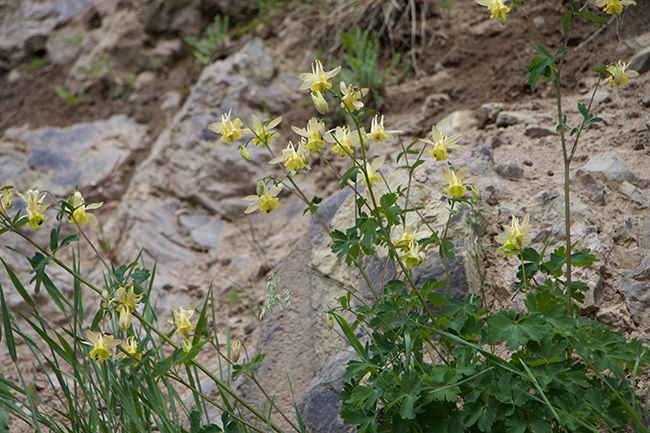 Silky Fringe, Phacelia sericea on Mount Washburn, 9,000 ft.
A yellow columbine (with a few pinkish specimens) also blooming on Mount Washburn. 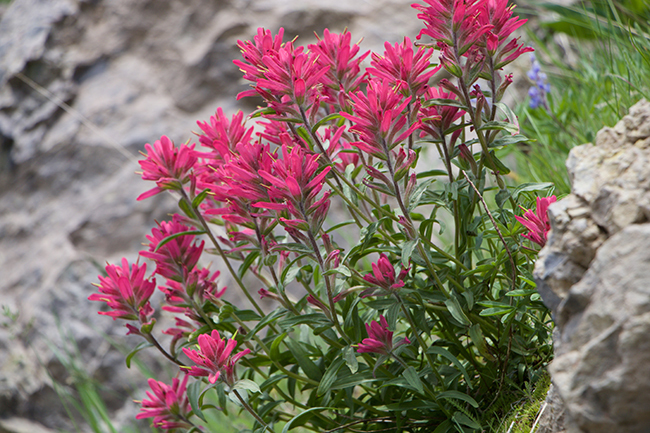 Also on Mount Washburn, Castilleja rhexifolia (Rhexia-leaved Indian Paintbrush) offered a brilliant pink display on rocky cliffs. 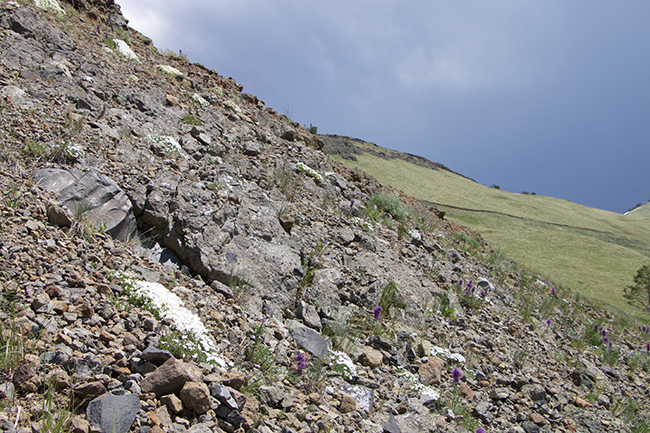 We saw the alpine mountain phlox, Phlox multiflora growing above tree line in many locations in the Tetons and in Colorado in the Rockies on this trip, but the ones growing in Yellowstone at high elevation near 10,000 were some of the nicest specimens. 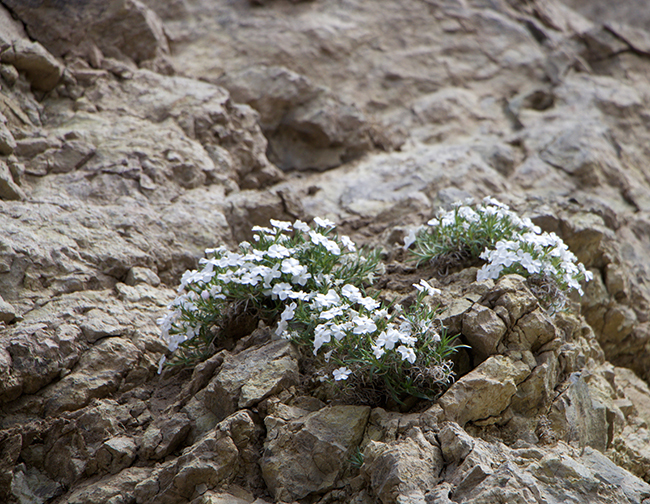 Phlox multiflora growing high on a steep cliff on Mount Washburn. 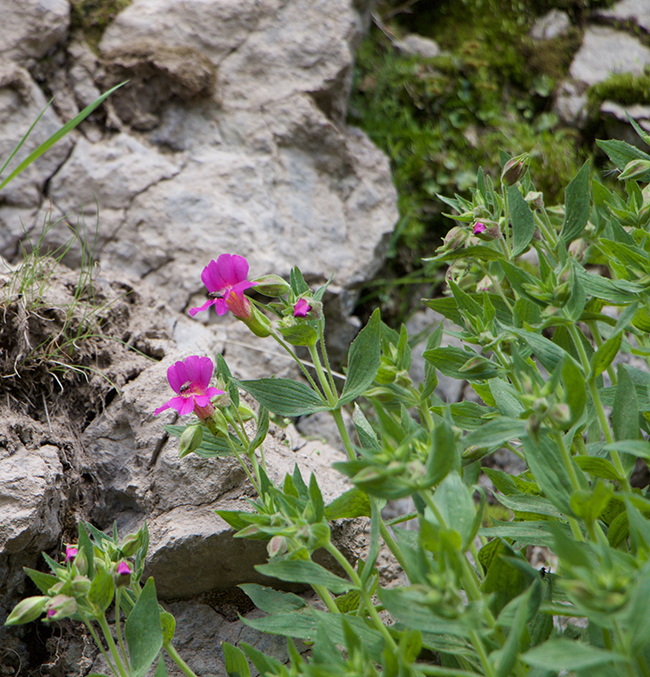 We found phlox growing in meadows, on sandy slopes in full fun, in shady areas and on bare, exposed cliffs.